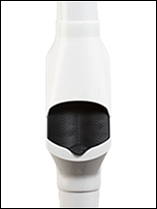 The Marley Curve® is a new era leaf diverter that combines sleek, sophisticated design with innovative filtering technology. Its unique screen design draws rainwater in while preventing leaves and other debris from entering into your water tank or stormwater system. Suitable for new or existing downpipes, the Marley Curve® has been designed in New Zealand to meet all rainfall conditions. Curve® helps to improve water quality and reduce system maintenance by delivering cleaner water to your tank. If on stormwater Curve® reduces the chance of your drains blocking. Curve® has the same UV resistance and 15 year guarantee as our Marley spouting and downpipe systems. It automatically sheds debris so requires minimal maintenance. Curve® is available in a range of colours to match the Marley Stratus Design Series® range of spouting and downpipes. Curve® is compatible with Marley’s RP80® 80mm round downpipe system. No glue is required and Curve® can be mounted anywhere on the downpipe in five simples steps. Click here for instructions. Guarantee: 15 years if installed as part of a Marley spouting and downpipe system, and properly maintained. RP80® 80mm round downpipe – All colours. Adaptors available to enable use with Marley RP65® 65mm round downpipe. The Curve is quick and simple to install and comes with a self-adhesive cutting and instruction template. If unsure please speak to a trade professional. If Curve is being connected to a tank, the tank must be at least 300mm lower than the spouting and the Curve must be above the inlet to the tank. Consideration should always be given as to where the debris will be discharged e.g. if possible avoid discharging onto pathways and decks. Regularly check the filter screen to ensure that there are no debris blocking the water flow. Routinely wash the filter screen. Simply slide the quick release upper body up the pipe to allow removal of the screen from the bottom unit, then rinse. Replacement filter screens are available if required. *Based on simulating light to heavy rainfall under controlled test conditions. Actual performance will vary depending on the particular environment, climatic conditions and presence of leaf matter and other debris.